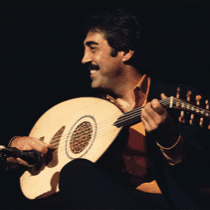 Simon Shaheen is one of the most significant Arab musicians, performers, and composers of his generation. His work incorporates and reflects a legacy of Arabic music, while it forges ahead to new frontiers, embracing many different styles in the process. This unique contribution to the world of arts was recognized in 1994 when Shaheen was honored with the prestigious National Heritage Award at the White House. Since 1994, Shaheen has produced the Annual Arab Festival of Arts, called Mahrajan al-Fan. Held in New York, the festival showcases the work of the finest Arab artists, while presenting the scope, depth, and quality of Arab culture. To continue this exposure to Arab music and culture, Shaheen founded the Annual Arabic Music Retreat in 1997. Held each summer at Mount Holyoke College, South Hadley, Massachusetts, this weeklong intensive program of Arabic music studies draws participants from the U.S. and abroad. Shaheen has been teaching at Berklee College of Music, Boston, since 2011 and directs the Global String Ensemble as well as Qantara Berklee, an Arabic music ensemble composed of students enrolled at the campus. He teaches violin, cello, and mandolin, along with the Arabic oud and kanun.